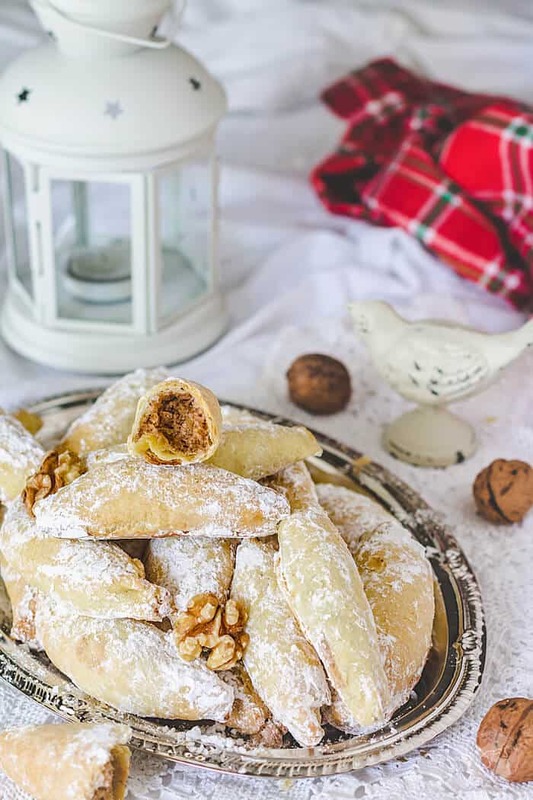 Who doesn’t love traditional Christmas treat of Eastern Europe, the buttery Polish walnut kiflies, the delicate and addictive crescent cookies that melt-in-your-mouth? Are you drooling yet? We have an easy recipe that feeds the crowd and it’s the one Christmas cookie recipe every mom needs to have. If you’re like me, you’ve baked many labor-intensive cookies with tons of ingredients that only yielded about a dozen. That’s fine if you have absolutely no one to share them with. But who are we kidding? No worries when it comes to this kiflies (aka kieflies or kiffles) recipe because just a few ingredients yield an abundance of cookies. I even cut the original recipe in half and still have plenty to go around. They’re super easy to make but are somewhat time-consuming, so please read the recipe in its entirety before starting. If you come from a European household, like me, any kind of “crescent cookie” sounds like a legend to you. They were something only your grandmother could execute properly, and it even took her years to perfect. They were a special treat, only something you’d be able to experience around the holidays. Your beautiful grandmother would open the tin of cookies after dinner, all perfectly shaped. She would walk around the table and allow all of the grandkids to take one, and the aroma would float around your nose. If this makes you incredibly nostalgic, then it’s time for you to master the recipe yourself! 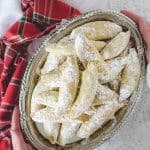 Kiflies are Eastern European crescent cookies with a flaky outside and delectable walnut or fruit filling rolled in powdered sugar, however, they’re not overly sweet. They are also called rolls, roszke, rosky or rosćići (little horns), depending on the country that claims them. Making the dough is a whole craft itself, but it is worth all of time and effort put into it. Yes, it’s one of those “make the dough a day before and let it sit overnight recipes.” But baking is all about making something we love, and not buying it from the store. Plus, making these cookies has some sentiment to them. My grandmother loved baking for the holidays, and not just because she was good at it. Baking wasn’t something that “needed to be done” in time for Christmas family dinner, but rather a Christmas activity. Like how families go see the Christmas tree lit up in their city, or decorate their Christmas tree together. These cookies bring us fond memories of a grandmother making them in the kitchen, and us sitting around watching her as she told us stories. Mine had a little radio on the counter that would play holiday tunes very softly. That’s what Christmas is all about right? Taking every opportunity to spend time with family and enjoying those little traditions every year. 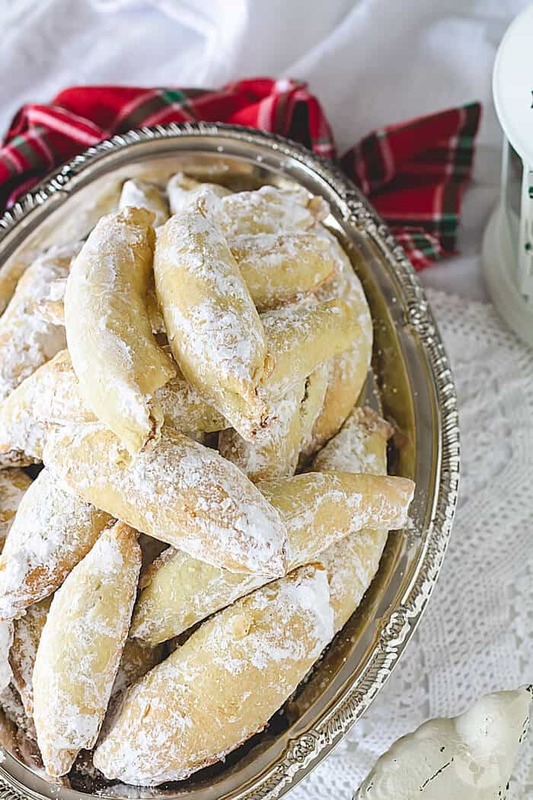 Aside from being absolutely delectable and mouth-watering, these holiday crescent cookies can also become part of your family’s Christmas traditions. If you sat in on your grandmother making them one year, or you lost that little scribble-note that she gave you with all the ingredients and instructions on it, I hope that this recipe helps you recreate them just as well! 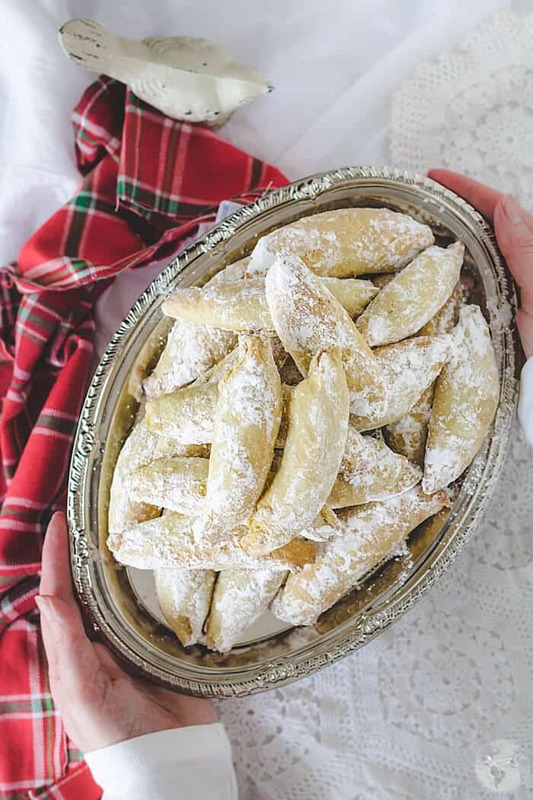 For those of you who are gluten-intolerant, you’ll love this gluten-free kiflie recipe from another fellow South Bender (her Christmas memories also involve grandma baking kiflies). A word to the wise is to put some aside for yourself when you’re done baking your batch. Don’t be surprised when you open your tin of cookies and everyone comes running. They’re just that irresistible, especially during the holidays. You can add a teaspoon of vanilla to the filling. For nut allergies, replace the walnut filling with your favorite jam or pastry fruit filling. Bake the cookies distributed between two large cookie sheets on convection setting or bake in batches. In a large bowl, using a pastry blender, fork or a food processor, blend the butter into the flour creating a coarse, crumb-like consistency. In a separate bowl, mix the egg yolks and sour cream. Add to flour mixture. Blend and knead lightly until mixture is like pie dough. Shape into small, walnut-sized balls and refrigerate overnight (makes about 52-56 balls). Place egg whites in an airtight container and refrigerate. The next day, beat the egg whites until stiff. Add powdered sugar and beat well. Stir in nuts and refrigerate. To a medium bowl, add 2 tablespoons each of all-purpose flour and sugar. Take half the balls out of the refrigerator and place in flour/sugar mixture. Keep the rest chilled. Roll balls out on a small amount of flour/sugar mixture into a thin circle. Place a heaping teaspoon of filling on each and roll up into a crescent shape. Pinch ends. Place seam-side down on a greased cookie sheet. Bake at 350 degrees Fahrenheit for 12 to 15 minutes. Cool slightly and dip in a bowl of confectioners’ sugar. Store the kiflies in a cool place. Traditional Christmas treat of Eastern Europe, these easy Polish walnut kiflies are buttery, melt-in-your-mouth, delicate cookies. Bake at 350 degrees Fahrenheit for 12 to 15 minutes. Cool slightly and dip in a bowl of confectioners' sugar. Store the kiflies in a cool place. Featured on: A Pinch of Joy, The Cottage Market, City of Creative Dreams, and Eclectic Red Barn. GET UPDATES AND FREEBIES BY SUBSCRIBING TO ALL THAT’S JAS MAILING LIST BELOW! You’ve got me crying this morning Jas. My grandmother was the daughter of Hungarian immigrants and she made something very similar. No one ever got her recipe and she had dementia for ten years and passed away in 2015. This recipe is very special. Thanks for sharing! Awe, so sorry about your grandmother, Marissa! Hope you find this recipe similar to hers and that it will bring you some comfort and perhaps a new family tradition. Sending you many hugs and blessings. Yes, there are many versions, depending on the country. A version of the rolled cookies, like yours, are also popular in my homeland. They’re filled with nuts, jam, or poppy seed filling. YUM! I love reading recipes and old family favorite, I have one as well, my Cherry Slice made with maraschino cherries that originally were suppose to have candied cherries, which I dont care for. Please be sure to stop by and share your recipes on #OMHGFF so I can feature next week!! Hope you have a lovely weekend, Holiday Greetings!! Mmm, those cherry slices sound delicious. Happy holidays, Karren! Christmas cooking traditions are so wonderful. I have such fond memories of Christmas cookie making with my kids. Now as for your Kiflies, I say bravo to you. I’ve not tasted these but will endeavor to do so. Thanks for the jam idea. We have some nice cloudberry jam that will be perfect for this. Oh, lucky you! I’ve never had cloudberries before. These look delicious! I’ve actually never heard of them! This is such a wonderful one of a kindrecipe. Walnut delight so lovingly wrapped and prepared. Thanks for sharing at FF. Oh my, these are going on my baking list. I love trying new cookie recipe and this one sounds so delicious! They disappeared quickly, Erlene! 😀 Happy holidays! When I was young, we made these all the time. They were my mother’s favorite cookie. Funny thing was, I was not all that fond of them and she would make soooo many of these cookies. She doesn’t make them any more and this was the first time I have seen them in a long time. Thanks for the memories. Please stop by Over The Moon Linky party since your are being featured. I’m glad these triggered childhood memories, Bev! Cookies (and food in general) tend to have that power, right? Thank you for the feature! Always an honor. Hugs! very nice its looking good thank you for shearing keep it up.